What do Facebook, Goldfish, and Pavlov have in common? As a dog trainer, I’m constantly seeing human behavior and secretly thinking to myself, “oh my goodness. That is just like dog training!” I try not to utter those words out loud because many people get offended if you tell them they are behaving like a dog. 🙂 However, the beauty of dog training is that it isn’t DOG training. It’s learning theory and learning theory applies to all living creatures that have the ability to learn – whether it’s a goldfish or a human. Don’t believe me about the goldfish? 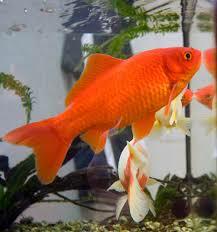 Check out this You Tube video of a goldfish performing trained tricks! There are two kinds of behaviors – learned and innate. Learned behaviors are dogs sitting upon request or a driver stopping at a stop sign. Someone taught us that there was a certain cue that should be followed by a certain response. We do this behavior intentionally and consciously. Innate behaviors are not conscious or learned. This is your heart beating faster or your palms sweating. For a dog, this might be panting or drooling. This is the kind of behavior I want to talk about today. Basically, you don’t have control over the response; your body does it on its own. The infamous example of this is Pavlov and his dogs. If you’re not familiar with the story, Pavlov was a behavioral researcher who was studying how much dogs drool. He knew dogs would drool if they saw food or knew food was coming. By complete happenstance, there was a bell that would ring when someone would bring the food into the dogs’ room. This was actually not part of the experiment! Luckily, Pavlov was paying attention and noticed that eventually, the dogs started drooling at the sound of the bell – before the food was even near them. The dogs’ brains had learned that the bell predicted food so their innate bodily response was to start drooling! Pavlov even found that the dogs would drool even if no food was incoming. The bell now could illicit the drooling. Those of you who have worked with me on teaching our dogs the magic word of “yes” have used Pavlov’s research! 🙂 By conditioning our dogs to love the word “yes” we are creating a innate, happy response in our dogs. Then, we capitalize on that emotion to reward them for good behavior. But….what if it all goes wrong? Recently, I was in a very heated conversation with someone and we were chatting via Facebook messenger. The messenger app comes with a distinct “ping” sound when your receive a new message. I’ve been using this app for years and years and years. I’ve always been a little excited to hear that sound. “Oh? Someone wants to talk to me! Yay!” However, in the short two weeks that I was in this heated conversation, my brain quickly dissassembled the previous, happy response and built a new, very negative response to that sound. Now, when I hear the Facebook messenger “ping” sound, I feel my blood pressure rise, my heart beat faster, and my breather get quicker and shallower. YEARS of good interactions with that sound were undone in less than two weeks. Fortunately, that incident is resolved, but my body doesn’t quite know that yet! I still get stressed when I hear that sound. So how can we help our dogs over come this issue? How can I help myself over come the Facebook messenger “ping” anxiety? The first step is to allow for some time. All recovery like this takes time. Second, ensure that there is not any further negative exposure to the stimulus. For the dog, that means preventing them from interacting with strange dogs for a while. For me, that means uninstalling the Messenger app so I literally won’t hear that sound any more. The next step is to perform a very calculated re-entry into the situation that caused the stress. These re-entries must be very calculated and set up to ensure that only good things will happen. For the dog, this means working with a trainer like me with known dogs who will not engage in aggressive behaviors toward the traumatized dog. For me, that means increasing privacy on my Facebook account so only certain, safe people can message me. Love learning about dogs? Come hang out in my VIP Facebook group! Found HERE.